It’s hard work, turning a video game into a board game. Video games are big, sprawling pieces of audio-visual entertainment. They come packed with AI, can resolve battles in an instant and look fantastic while doing it all. It’s unfair to ask a board game, with its sedate pacing, books full of rules and cardboard pieces, “to just do the same thing, only on a table”. Decisions have to be made on where to make necessary cuts and changes. Usually, that means a board game designer (or designers) looks at a video game, decides what the core experiences and themes are, and does their best to try and replicate that within the confines of their own medium. Fantasy Flight managed to do that twice in 2017, and to excellent effect. Doom might not have been as fast and bloody as its video game inspiration, but its emphasis on switching weaponry and the heat of close-quarters gunplay meant it felt very much like Doom. Fallout was much the same: it didn’t take 400 hours to finish, but it did a fantastic job of replicating the sensation of being of a lone character trawling the wastes trying to survive (and getting caught up in a story). 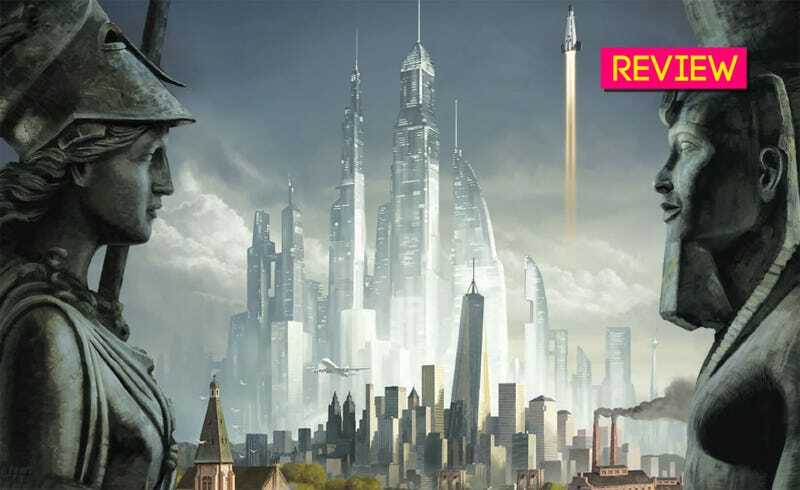 The publisher’s third attempt, Civilization: New Dawn, is nowhere near as good. It reaches too far, and by cutting straight to the heart of Civilization’s video game design, forgets everything else that makes Civ so much fun on a computer. The game. The coloured dials are the tech counters, the four piles of coloured cards on the left are World Wonders that are available to build. New Dawn recognises that they key to victory in Civ is in focusing your efforts. Each game begins with a series of very specific victory conditions laid out to the side of the map, and only by completing a number of these can you claim a win. Some examples are building two military wonders, controlling a certain percentage of the map and reaching the end of the tech tree. This approach works in the video game because most (sorry, culture) victory paths are designed to showcase one of Civ’s many complimentary systems that control the ebb and flow of the world. A military victory comes at the end of an exhaustive strategic campaign, for example, and it’s a detailed and complex way to win the game in its own right. Here, it’s not. In order to accommodate this targeted approach, and presumably to keep the rulebook under 10,000 pages, everything you know and love about Civ—war, diplomacy, trade, exploration, settlement—has been stripped to the bone, to the point where little of it is actually any fun. Each card contains possible actions. The terrain section up top indicates where you can build or move; 4, for example, can be everything on desert or below, while only a 5 can access mountains. If you play the 5 card, it drops back to 1, and every other card moves up a space. The game is built on giving the player a choice between five possible actions every turn. These actions are displayed on technology cards, which you upgrade as you progress through the game. The decisions are made more complex by the fact that they’re ranked 1-5: choose the third card and it returns back to first place with 1-2 moving up, and in doing so losing much of its power (all cards contain terrain-based bonuses, with mountains only able to be built on or traversed by playing a 5 card, for example, while there are other bonuses afforded to combat values by playing a 4 instead of a 1). The main actions you can take most turns are building a city or wonder, expanding (or fortifying) your territory, advancing down the tech tree, moving your trade caravans and attacking barbarians (or rival players). Which sounds varied and exciting, until you consider that most actions are incredibly simple and unfulfilling. There are no military units, with combat simply resolved by rolling two dice whenever a player’s area of control gets within range of a rival or barbarian. There’s no diplomacy unless you send a caravan to a rival city or city state, and that doesn’t happen very often (and in return you’re simply granted a card with perks on it, not any kind of meaningful discourse). There are city states dotting the map, which you’re able to visit to gain perks and the resources needed to build World Wonders. Here’s one of my caravans dropping in on Buenos Aires. Most disappointing is the way tech has been handled. There isn’t a full tech tree like in the video game, which you can slowly work your way down; instead there’s just a dial that ratchets up every time you choose to increase it, and every time you hit a certain threshold you’re allowed to upgrade one of your action cards. It’s all just...a bit boring. Civilization is a game about nations colliding, as armies and leaders meet constantly to shape the future which you can literally see unfolding around you, but little of that is to be found in New Dawn. It’s a bizarrely solitary experience, as most of the time players simple keep to themselves, secretly pursuing victory conditions while performing underwhelming tasks. None of the best parts of the video game have made it here. The thrill of settling a new city is absent, military strategy is almost non-existent, and there’s none of the banter and horse-trading that makes up so much of the diplomatic experience. New Dawn has got the overall theme right, but it’s the minute-to-minute minutiae that’s Civ’s real hallmark, and that’s been completely overlooked here. There’s a recommended starter map for the first time you play, but after that players are free to build their own. If there’s one cool thing about the game, it’s seeing the world take shape as players take turns dropping large hex templates onto the table. New Dawn is a failure as an adaptation, then, but if you’re just interested in this as a board game, with no attachment to Sid Meier’s series, is it any good? I’m probably not the best person to ask, as not only are my own views clouded by 27 years of Civ on the PC, but everyone in my crew I played this with are long-time video game veterans as well. I’m going to guess, though, that anyone interested in the concept might be better served playing the more complex 2010 Civilization board game, or even the colossal 1980 edition, which predates the video game series and was quietly one of its biggest inspirations. I had high hopes for New Dawn when I first saw it. Its shift to hexes (the last Civ board game was based on a grid) had me excited, the same way I was when the video games made that leap between Civ IV and V, and the victory path design seemed like a good fit for the source material. It’s a pity, then, that in an effort to streamline the Civ experience New Dawn goes too far, stripping away most of the fun along with the systems. Those orange tokens spreading out from the city are how the game handles areas of control.